NASA Earth Observatory image by Joshua Stevens, using GEOS-5 data from the Global Modeling and Assimilation Office at NASA GSFC. Text by Kathryn Hansen. 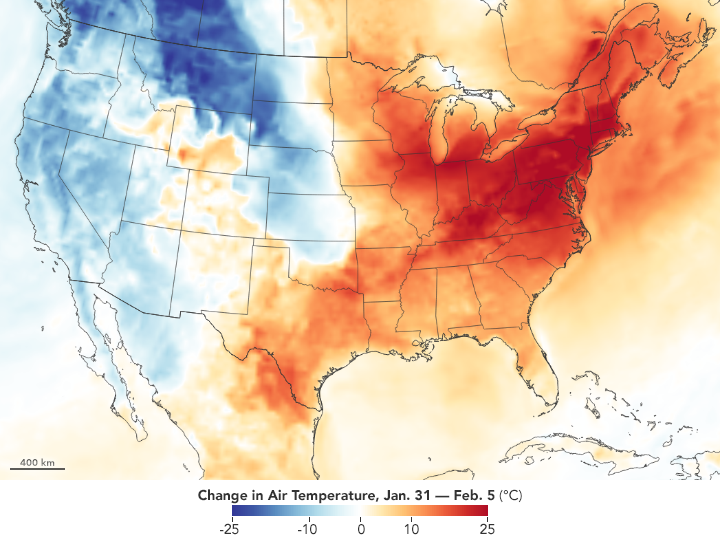 The dramatic swing is visible in the map above, which shows the change in air temperatures between 1 p.m. Eastern Standard Time on January 29, 2019, and 1 p.m. EST on February 5. The map was derived from the Goddard Earth Observing System (GEOS) model, and represents air temperatures at 2 meters (about 6.5 feet) above the ground. 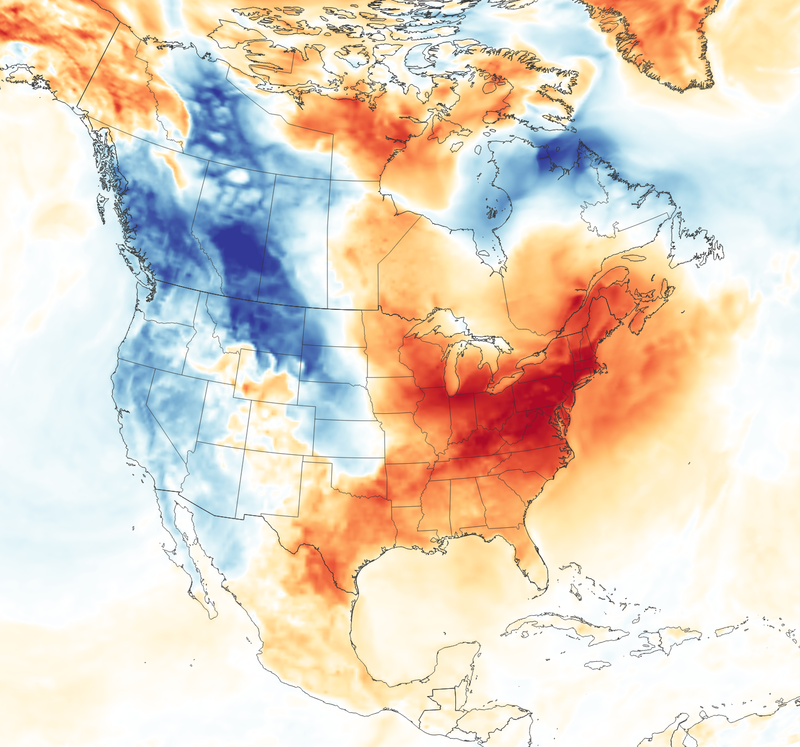 The darkest red areas represent a jump in temperature by as much as 25 degrees Celsius (45 degrees Fahrenheit). Measurements reported by the National Weather Service show that the daily high temperature in Boston jumped 26°C (47°F) between January 29 and February 5. New York and Washington D.C. warmed warmed by about 27°C. The warm weather pattern was expected to continue through most of the week, before cooling to near average for the time of year. Los Angeles Times (2019, February 6) With impressive L.A. rain and Bay Area snow, hope rises for a rare wet winter. Accessed February 6, 2019. NASA Earth Observatory (2019, January 30) Arctic Weather Plunges into North America. National Weather Service (2019, February 5) Boston, MA. Accessed February 6, 2019. National Weather Service (2019, February 5) Baltimore/Washington. Accessed February 6, 2019. National Weather Service (2019, February 5) New York, NY. Accessed February 6, 2019.